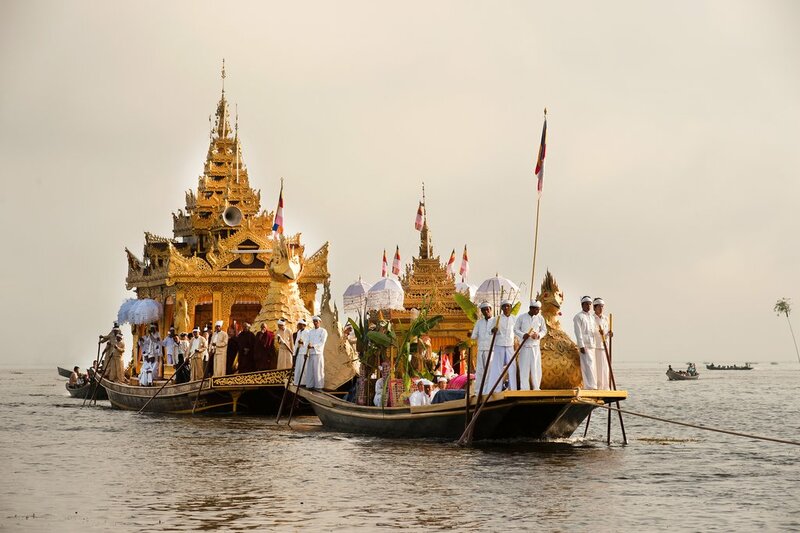 Myanmar is an amazing place to witness some of the most unique festivals in the world. There is always something taking place somewhere in the country. Most festivals are cultural and religious, offering intriguing and colorful experiences for visitors. Dates change each year, so check which will be on while you're traveling through the country. It's a particularly good idea to look out for the lively pagoda festivals, which happen regularly and throughout Myanmar. One of the biggest events on the Bagan Calendar, the Ananda Temple Festival features a huge variety of dances, plays, and songs. A highlight is the fascinating play of Anyeints: the performance lasts several hours and provides an interesting mix of comedy and traditional puppetry. 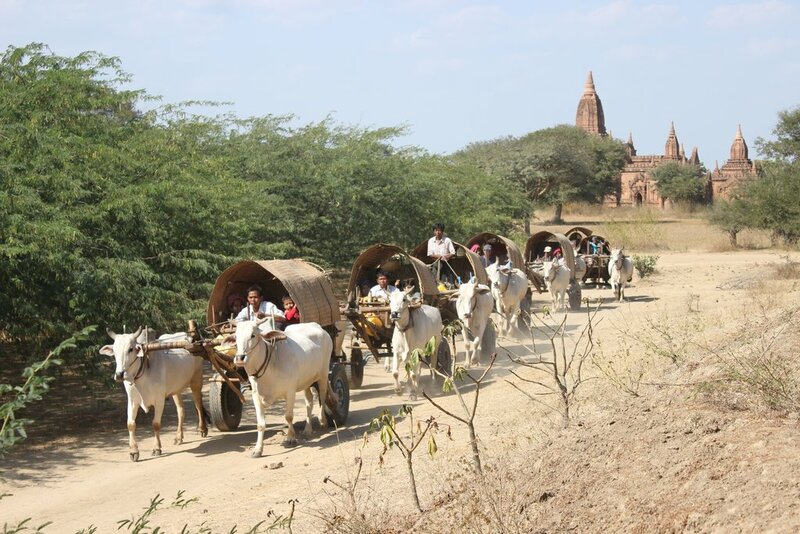 About four or five days before the full moon, caravans of bullock carts from villages around Bagan come to the festival, camping around Ananda Temple for about a week, turning the area into a country fair. The event held on the full moon day is the biggest and the highlight of the festival. Starting around 6 a.m., over a thousand monks from the area arrive to accept offerings of filled alms bowls. The different clans of the Kachin people of northern Myanmar gather in Myitkyinato for the Manaw Festival. This was originally an animist festival to show gratitude to ancestral spirits and pray for a bright future but is now more of a New Year's celebration, where tribes are reunited. People come to this festival dressed in their finest traditional costumes. The main feature is when participants join a spiritual dance, lining up behind one another around erect Manaw poles, quite similar to North American totem poles. Chieftains are expected to bear the expenses of the festival; the largest payment recorded for this festival was 14 buffaloes, 20 cows, 20 pigs, 50 chickens, 200 baskets of rice and 4,500 bottles of spirits! Deep in north-western Myanmar, near the Chin Hills, are the Nar-ga villages of Lahe, Layshi, Hkamti, and Nanyun people. The area is very remote and difficult to access, but this is an exciting event for adventurous travelers. The festival takes place in mid-January every year, and essentially gives thanks to the earth for a bountiful harvest. It's a time for tribes to meet, sing, dance, and feast. An opening ceremony is held on the first day, where traditional dances are performed beside stunning bonfires. The next day, competitions of traditional sports start. The festival concludes with a celebratory feast of rice wine and roasted meat, and more incredible tribal dances are performed to the beating of drums. 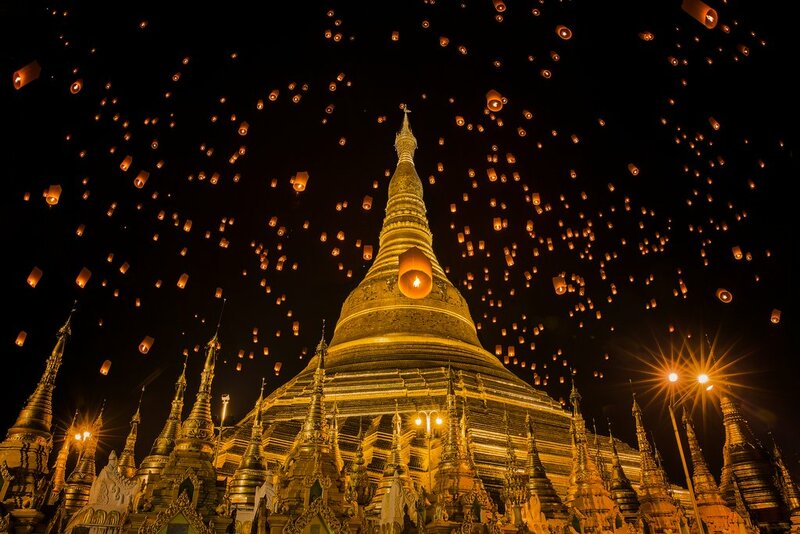 Located at Kyaik Khauk Pagoda, the atmosphere of the Golden Hilltop Festival is similar to that of a fun fair. Villagers travel from neighboring villages by ox-cart to enjoy this colorful festival. Numerous stalls sell delicious local cuisine, clay pots, furniture, bamboo mats, and other items. Performances take place late into the evening. Tobodwe is the 11th month according to Myanmar's Lunar Calendar and is the month of new harvest. Throughout the country during this month, a glutinous rice-based savory snack called htamane is prepared and offered to pagodas, monks, friends, and neighbors, to gain merit. Htamane feasts in some parts of the country are seen as a form of friendly competition. The seasonal delicacy is made with great team spirit and encouragement from spectators. Participating in the festival provides travelers with a good opportunity to feel true Myanmar hospitality. This colorful festival generally lasts for two weeks, and many Buddhists from around the country make the pilgrimage to Mandalay. The renowned Mahamuni Buddha image is at the center of activities, and incense sticks are burnt to commemorate Buddha. A variety of stalls are set up, especially in the evening and at night, and many interesting local plays, dances, and songs are held. Htamane contests take place in the pagoda compound on the night of the eve of the full moon. Early in the morning of the day of the full moon, the delicious snack is offered to the image of the Mahamuni Buddha, and then to all attendees of the festival. Like most pagoda festivals in Myanmar, the Nyantaw Pagoda Festival features all the color, life along with song and dance that makes these incredible events so interesting. Many Shan and other hill tribes come down to sell their products at the lively market that is set u for the festival. The Indawgyi Festival takes place approximately 100 miles from Myitkyina, in far northern Myanmar. It lasts for eight days. Two sand banks appear in the lake before the festival, created by the currents in the water, and create pathways out to the pagoda; the locals believe that one is for humans and the other for gods. Both sandbanks disappear after the festival. The gilded “four images of Buddha” are locked up for the rest of the year, and only displayed for public worship during this festival. Buddhists come from around the country to see these images. Villagers from Palaung and the many hill tribe villages scattered around the area come to sell their tea, jewelry, and other hand-made products. During this festival held at the beautiful Pindaya Caves, thousands of pilgrims come to worship at the pagoda. Hundreds of small stalls line the entrance, selling local foods, handicrafts, Burmese cigars and more. The Shan tribes also parade their colorful costumes. This is a good opportunity to combine a festival with a major cultural site in Myanmar, as the Pindaya Caves' 8000+ Buddha statues are a must-see sight. At the Kakku Pagoda Festival, there is a chance to see the unique black outfits of the Pa-O people. The most interesting time to visit is before dawn on the full moon day of Tabaung, as the Pa-O people come in all their finery with colorfully decorated trays bearing food offerings. Anata Pagoda Festival. Photo courtesy of Myanmar Diaries. This traditional Shan festival takes place in the north of the country, at Pyin Oo Lwin. Stalls sell almost every imaginable item, and traditional performances are held. Although held in one of Yangon's most iconic temples, this festival is for all citizens of Myanmar. People come to worship Buddha, and his images are offered water, light, and flowers. This festival features live performances of traditional song and dance. Many locals sell their products, including the best-selling traditional toys of the region that are made of dried toddy palm leaves. This unique festival is believed to be the most prominent gathering of witches on earth. Legend has it that Ye Kin Kadaw, Queen of Witches, had extraordinary powers; the king forced her into exile at Maung Dong, where she drowned. She is commemorated at her shrine during the festival with offerings of bananas, betel leaves, coconuts, and flowers. Featuring the vibrancy and life of most other pagoda festivals, evening entertainment includes dance-drama-concert-acrobatics such as Zats and Anyeints, and fairs selling all kinds of goodies. New Year is celebrated in April, and everyone has a great time splashing each other with water. While the young and young at heart douse each other in water, the older take retreat in pagodas and monasteries to perform meritorious deeds. It's difficult to stay dry during this festival, so it's better to leave your valuables behind and join in! This unique festival comprises various classical Nat dances on Mt. Popa, a volcano in central Myanmar. It can become very crowded on the mountain, but it's certainly a unique cultural experience that travelers won't forget. 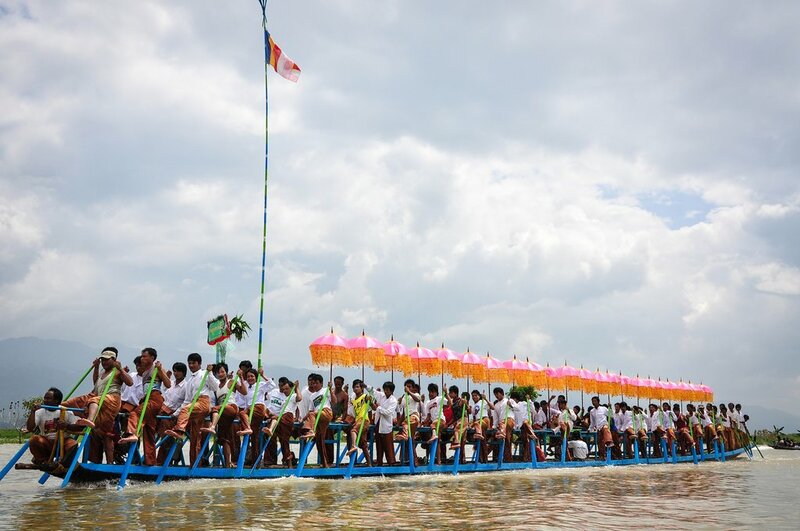 While this festival features the color and excitement of all other pagoda festivals, there are also other special activities like boat races and traditional wrestling. Devotees offer thousands of oil lamps and flowers to Buddha at night. The Chinlone festival, or cane ball tournament, takes place in Mahamuni Pagoda for more than a month, day and night. Cane ball players make their way from all over the country, as well as from other countries too. The game is the traditional national sport of Myanmar, and at this festival, visitors can see the game played either as a team or individually. Local folk music is also played during the competition. This is a lively festival and market that takes place around Ho-Shin Pagoda, in Pakokku on the Irrawaddy River. Entertainment consists of Zat and Anyeint performances, as well as movies. The legend behind this festival states that the two sons of the youngest brother of King Mindon were struck by a teak trunk in the Ayeyarwaddy River and accidentally killed. Since then, the children are believed to be the keepers of the Ayeyarwaddy River. This regional festival commemorates them. 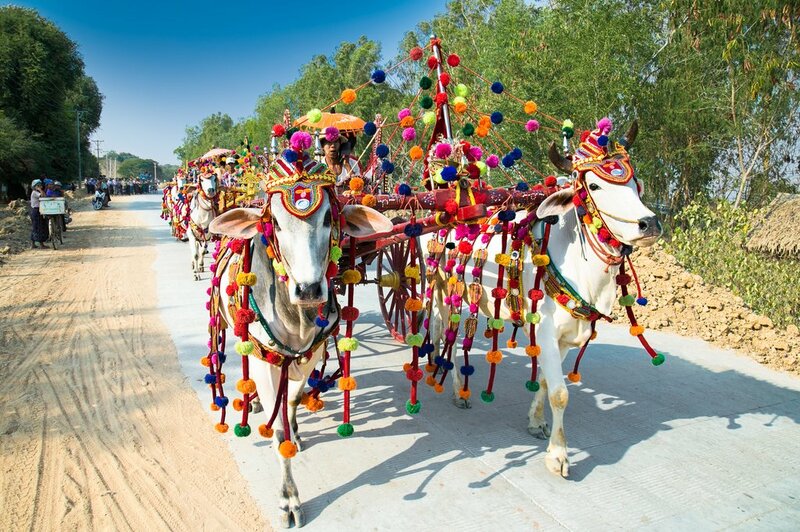 Farmers come dressed in their colorful clothing, with amazing bullock carts. Traditional performances are the main feature, and several kinds of ceramic ware from the Sagaing and Kyauk Myaung areas are sold. This festival is celebrated in honor of two powerful spirit brothers and is a prominent gathering spot for mediums to contact spirits. It's one of the most colorful and important festivals for Nat (spirit) worshipers in the country. Visitors can also see many dances and traditional performances. This unique event is famous because of the enjoyable boat trip to the site. The festival is held in honor of Mewanna, Goddess of Popa, a powerful spirit and protector of women. 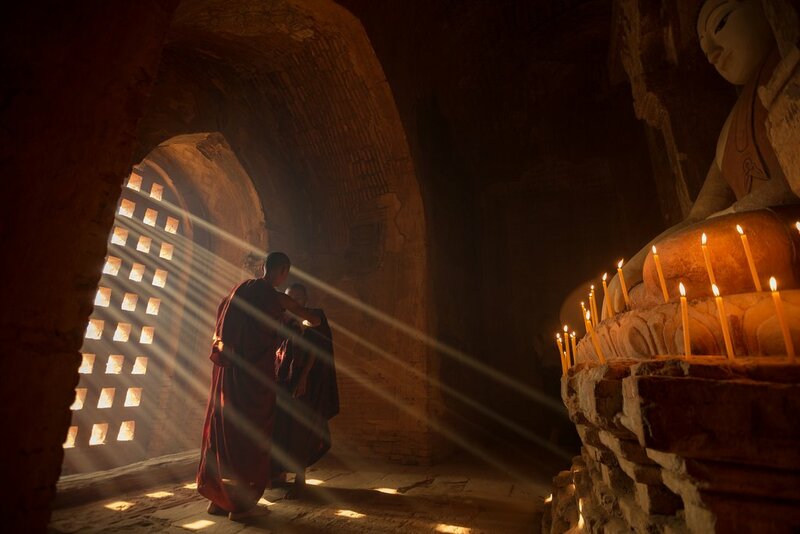 Her main shrine is on Popa Crest, near the extraordinary and unmissable site of Bagan. Pilgrims at this festival throw packets of tea leaves at one another and those who are hit must visit the following year, without fail. 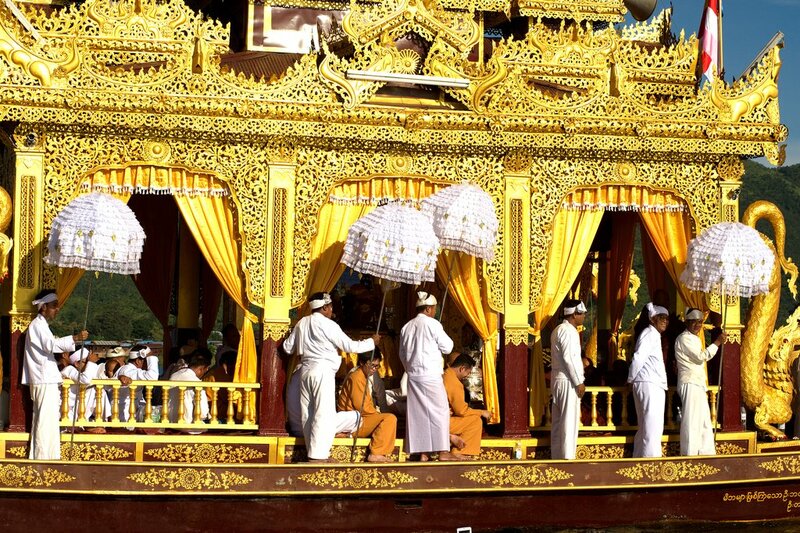 The main event of this festival is the procession barge that departs from Taungthaman Village and heads to Kun Taung Lake. Many local worshipers follow on small sampan boats. The journey takes approximately two hours, in the late morning. This festival is celebrated at Shwekyetyet Pagoda on the banks of Irrawaddy River. Like other Myanmar pagoda festivals, shops, food stalls, music, and songs are key components of the festival. In years when there is no flooding, a rowing competition is held and is a unique feature of this festival. 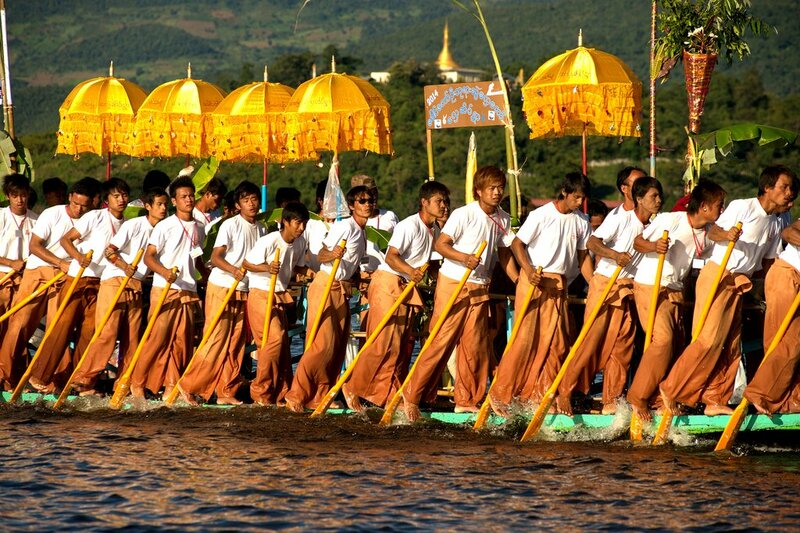 Visitors to the Phaung Daw Oo Pagoda Festival can watch the procession of leg-rowed boats, which ceremoniously tug four giant statues of Buddha on a barge across picturesque Inle Lake. Leg-rowed boat races take place on the lake, and hundreds of other vessels add to the festive environment. Thousands come to join in the celebrations from across Shan state. Located at the foot of Mandalay Hill is the Kyauk Daw Gyi Pagoda. The festival here is notable for the variety of locally produced goods sold, and the color and excitement is similar to most other pagoda festivals throughout Myanmar. Held in a small town not far from Mandalay is the exotic dummy elephant dance. A huge, light elephant is made from paper and bamboo, and men dance around the town to the beat of the traditional dobat drum. The elephant dancers gather at the foot of a hill to pay tribute to the Shwethalyaung Pagoda. This is one of the most prominent festivals of the year and marks the end of Buddhist Lent. Pagodas, houses, public buildings, parks, and monuments are all illuminated. Thadingyut is a celebration, but it is also an opportunity for Thanksgiving, and to pay homage to Buddhist monks, teachers, parents, and elders, as well as to ask pardon for misdeeds. After the full moon day of Thadingyut, this floating light festival is celebrated at a creek, near a small town of ShweKyin, near Bago. This area was closed to tourism until recently, so visitors will be able to witness an authentic local activity at this festival. Rowing races occur during the day, but the highlight of the festival occurs after dark: locals launch hundreds of lit candles on floating paper boats onto the water. 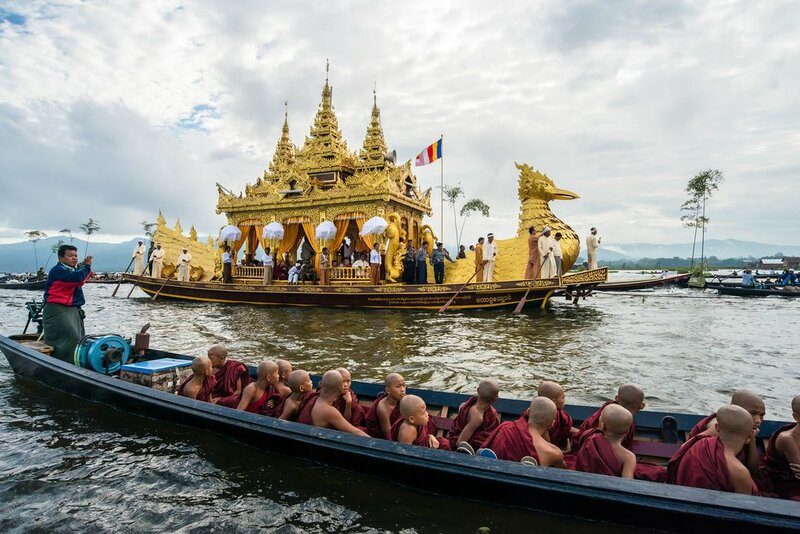 The Indein Pagoda Festival is a prominent Buddhist ceremony that takes place at the unique, fascinating old shrine complex on Inle Lake. As Indein is a must-visit place on any Myanmar itinerary, due to its spectacular and tightly grouped pagodas, this is a chance to experience the site in a slightly unusual way. This festival features a number of bullock carts, which carry products from the various surrounding hill tribes, who attend to sell their wares.It's a colorful festival, and items to look out for in particular include hand-woven cotton, clothes, and cane mats. The balloon festival at Taunggyi is one of Myanmar's most famous festivals. There are fireworks as well as a hot air balloon contest that's held during both the day and night. During the day, balloons resemble the shape of pagodas, while at night they appear like picturesque lanterns that light up the sky. The Shwezigon Festival features all the color and life that one should expect of a pagoda festival. Zat performances play a prominent role in the festivities: dances, songs, and plays. On the full moon day, starting from around 6 a.m., hundreds of monks from nearby villages arrive to accept offerings of filled alms bowls. This activity usually finished around 9.30 a.m. The Tazaungdaing Light Festival is held throughout the country. Streets are filled with lights, and Buddhists dress in full robes. A total of 9999 candles are lit at midnight, and salad containing Maezali buds are eaten, as it is believed to possess magical medicinal properties when eaten at this time. Color and excitement dominate this festival, and a number of plays, songs, and traditional dances are performed. Some locally produced items are sold, such as thanaka (the white paste used as a cosmetic in Myanmar), sandalwood, and woven textiles. At this festival, devotees come to pay homage to the Lord Buddha. People throw lotus flowers from the top of a giant stupa at Mahamuni Pagoda, which creates quite an attractive sight. This festival is much like other pagoda festivals; thanaka, sandalwood, and woven textiles (especially cotton blankets and longyis) can be bought at the stalls around the pagoda area. The Robe Weaving Contest takes places throughout the whole country. Teams of women compete to make saffron-colored robes called “Ma Tho Thin Gan”. At the end, the winning robes are offered to an image of Buddha early in the morning on the full moon day. This traditional celebration remains very similar to how it has been for hundreds of years. This festival takes place at what is arguably the most spectacular and breathtaking location in the country: the Golden Rock, where a massive golden boulder perches on the edge of a cliff. Pilgrims travel from across Myanmar to see the full moon, and to light 9999 at midnight. This is like many other pagoda festivals, but is unique because it commemorates the fact that during British colonial rule, the wife of a local Commissioner was relieved of her eye disease after she gave a pair of glasses to a statue of Buddha. Many people travel to this festival to make a similar offering of glasses to Buddha, in an effort to cure their eye diseases. Mt. Popa is one of the most sacred religious sites in Myanmar, and home to a prominent Nat worship center. This festival is dedicated to Minmahargiri Nat, believed to be the protector of households. In most Burmese homes it is customary to see a small shrine covered in red curtain dedicated to this Nat. 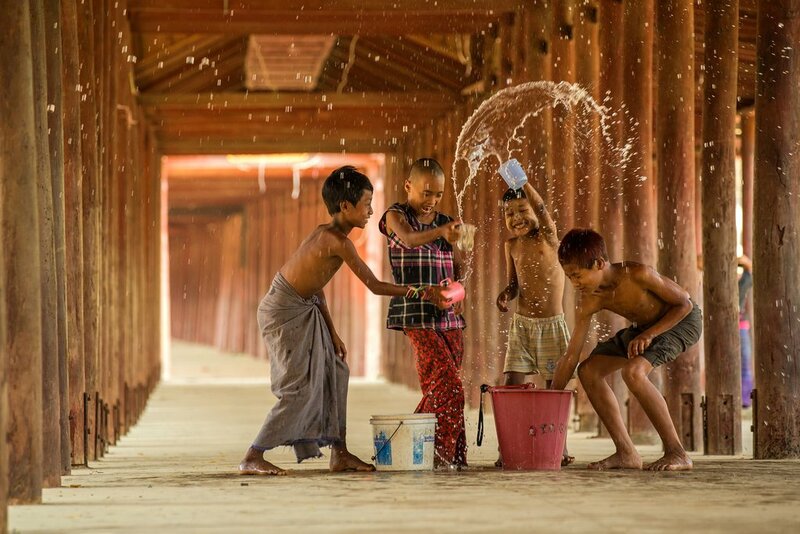 During this festival, thousands of Burmese flock to this site, creating a joyous and light-hearted atmosphere. Organized by the Devotees Association of Kyaikhtiyo (Golden Rock) on the last night of the Gregorian Calendar, pilgrims light nine thousand lamps to welcome the New Year and to give thanks to Buddha’s peaceful doctrine. This is certainly a beautiful and unique place to welcome in the New Year.